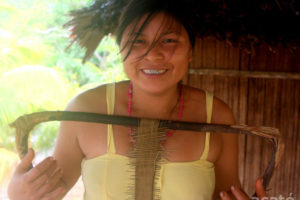 Lucinda posing with her traditional Matsés loom weaving a tasiuinec kinship bracelet. Lucinda is the daughter of Arturo, a famous Matsés warrior and plant medicine expert who wrote Chapter 3 of the Matsés Medicine Encyclopedia. She lives with her family in Buenas Lomas Nueva. She is a prolific farmer and is very fond of showing off and sharing her bountiful harvests. Her house is a hub of activity in the community, and no one ever leaves hungry. In addition to farming and taking care of her family, Lucinda also loves making bracelets and other Matsés traditional crafts on her homemade looms. She is expert at weaving the kinship bracelets, known as tasiuinec, that are specific to the Matsés tribe. These woven ornaments are tied on the wrist or ankle. A sister puts on her little brothers ankle ornament by slipping the knotted ends through little loops. As she grows, a girl will weave for her brother, her husband and then for her children, just as the boy will grow to ask for ornaments from his mother, his sister, and eventually his wife. 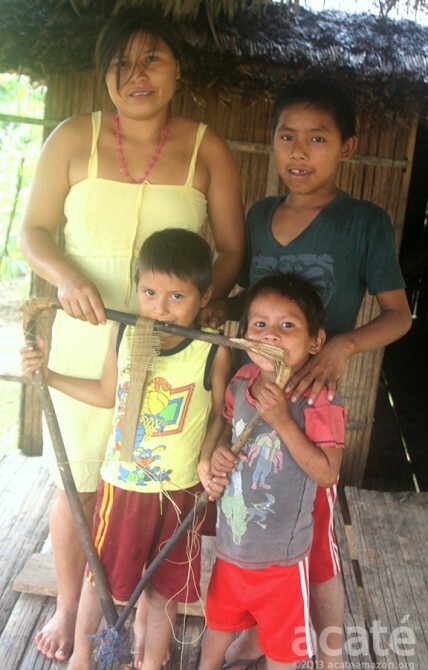 Lucinda is committed to preserving the Matsés territory and traditions while incorporating outside necessities like electric lights to help improve their standard of living. In addition to documenting their language and history, Dr. Fleck is also working with Matsés elders and shamans to help preserve their indigenous medicinal wisdom, all written in the Matsés language.